Caolyne Orazi, our editor for the past half year is busy packing to move to UK this month. We will all miss her. In the mean time, I have volunteered to be the editor. I would also like to remind you that OWA has decided to stop printing and mailing its newsletter starting January 2010. Many members think it is a greener approach. Our newsletter is still to be published bi-monthly and be posted on our site at the beginning of the odd number months. We encourage all our members to use our site more actively. This newsletter is part of our organizational history. It has served us well and many of you have been editors through the years. I started the one page cut and paste newsletter in 1973 to keep members informed. It is fortuitous that I am the editor for last printed issue. I feel a bit sentimental about this little publication. I will miss carrying this newsletter around to read when I am on public transit. At our October Business Meeting, Judy Rowe provided an introduction for the need for a new updated articles of incorporation and bylaws to meet current State requirements. Carol Brittain, an attorney and OWA member, explained the need for changes in the bylaws to comply with the law while leaving our historical horizontal structure remains unchanged. A steering committee (of five) is to act as “board of directors” with each person serving a two years. The three officers - President, secretary and treasurer (required by the state) are subordinate to and serving at the pleasure and discretion of the Steering Committee. Mui Ho discussed the History of OWA founded by Mui Ho and Wendy Bertrand – stressed the concept of horizontal structure in which ideas come from the bottom up rather than top down. The strength and vitality of OWA comes from this non-hierarchical structure. To continue this value that we shared for 36 years, Mui implored the terms “president, secretary and treasurer” which have a definite connotation, be used in the document only as required. Among members, these three titles shall be known as “OWA officers” and they are equal in responsibility and authority. There were 72 ballots cast but two of them were by non-members. The final counting of the ballots per Carol Brittain "at least 97% of the ballots cast approved the new Articles, Bylaws, and Steering Committee." We are grateful to Carol Brittain for her time and energy working with OWA to make our organization legal and updated. Some members might feel relieved that the bylaws have been overhauled, but the consequences for OWA are major. I appreciate various members posting their comments at owa site. because I live part time in the northern most part of the state and did not attend the OWA October 20, 2009. Sharing concerns is healthy for the individual and for the group. It helps one to understand, to feel included, and to participate. I hope you will join the discussion. One is that OWA used feminist principles of inclusiveness when we (and others) worked on the original bylaws. This was new, and not practiced in our field, and as Mui stated, it required the participation of most of the members. Two is that OWA uses the words “horizontal structure” to define our shape because at the beginning the members who took on the big tasks (Membership, Programs, Newsletter, Education and Money) remained on the same decision-making level—there was only one level — but we referred to these members collectively as the “Steering Committee.” We made it clear that we expected everyone to be a “Steering Committee” member when they had the time. We wanted broad participation and we wanted to avoid burnout. Three is that the OWA was horizontal for the entire organization; it avoided authority and encouraged responsibility. At that time, I wasn’t thinking of it as a safe guard against abuse of power or dominance. But I think we have learned over the years and by this recent change in style that we should have, at some point in the organization’s history, addressed this issue of safeguards. We now, more than ever, need safe guards in our bylaws, for example, audits, oversight, and term limits (Only two years or only four years etc.) to encourage full participation of our members and fresh blood. As to officers, Mui suggests we don’t use the terms. I don’t know all that was said at the meeting but I don’t think everyone is on the same page. These bylaws set up officers and a board of directors and they were voted in by a quorum of the members on October 20, 2009. People announced themselves as Mui Ho, Secretary and Judy Rowe, Treasurer, not mentioned but already decided was Janet Crane, President. This is all new. Why give names to those positions if no one is going to follow them. This is all too confusing. Trust is not built on saying one thing and doing another. Members need to know how the organization really works. In court, I bet the bylaws hold up. But who wants to go to court. Why not transparency åand integrity? Certainly, OWA has survived, because of the times, and the great people as much as the organization’s design. But the reduced number of business meetings has taken its toll, making it very difficult for members to stay connected. Steering Committee titles have changed over the years, in parallel with an increase in decision-making in what Mui calls “oversight.” And, even our egalitarian and flexible structure has developed weaknesses. Yes, we have survived and many of the members have been long time members and have been on the Steering Committee themselves. But all of a sudden, the organization is acting exactly like what we were trying to get away from and it is alarming to those of us who experienced true collaboration. Things are said in the OWA newsletter and then not respected. For example nominations from the floor was announced and two people wanted to be nominated and were not allowed to be. And there is no provision for nominations from the floor in the new bylaws and there could be. Now in the bylaws, the president appoints a nominating committee. Another sign of authority misused is that the new officers had been selected before the vote even took place, while the new bylaws say the board of directors decides on the officers. So, we have three layers in our vertical structure, with the members being the weakest (because our rights to decide and to be heard have been stripped in action and in the bylaws). We are no longer a “membership” nonprofit corporation we are a “public benefit” nonprofit corporation we only vote for board members. The rest of the business is taken care of by them, for example we no long vote on spending or policy. In the beginning, each member was valued, encouraged, and expected to participate, shoulder to shoulder—a big change for long time members. Maybe this comes because now the health plan members are in the majority (53% or 73 out of 138) and they don’t need the same structure we have used for 36 years. I will try to observe with an open mind but loosing ones democratic rights in an organization that was dear to my heart is hard to swallow. What do you think about all this? The Forum at www.owa-usa.org is for everyone to use. You can add your comment here. Hamilton Family Center is committed to break the cycle of homelessness and poverty, Through their Housing First approach, they have provided a dontinum of housing solutions and comprehensive services for families and individuals all year round. During the holiday season they provide presents and parties offering families with hope in the face of homelessness. OWA members are very proud that we are continuing our effort in making a fairer society. 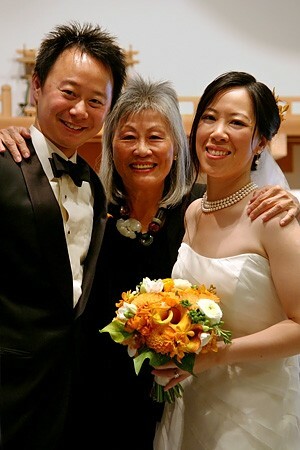 On 18 October 2009, Mignon O’Young, one of our new Steering Committee member starting 2010 got married in Berkeley. 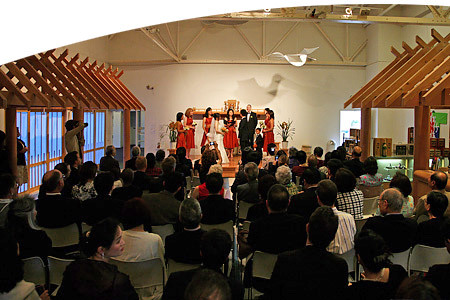 The ceremony was held at the Takara Tasting Room. Mignon has chosen this place for her wedding ceremony not only because it is a very beautiful space but it is the first architectural project Mignon worked on after she got her degree in Berkeley. This project is a forerunner of green architecture. The beautiful wood used in the Takara Tasting Room came from recycle wood and the tight grain Douglas Fir circular Columns are most impressive. For the bridal party, Mignon has chosen a burnt orange color for the bridesmaid’s dress with a dull gold sash which complimented the rich wood décor of this Tasting Room. I was very impressed by this persimmon color, commonly found in Japanese paintings, went so well with all different complexions and hair colors. Mignon looked gorgeous and happy and her husband Oliver looked very relaxed and happy as well. The ceremony was officiated by Mignon’s classmate Grace, another architect/mother. It was very short and sweet. Everyone loved the simple ceremony and we had wonderful sakai . For the reception dinner, all the guests moved on to East Ocean Restaurant with the view of San Francisco. Starting 1 January 2010, we will have four new Steering Committee members coming on board. Judy Rowe joined the SC middle this year will stay on. The new members are Mignon O’Young, Gilda Puente-Peters, Leslie Golden and Karleen Gullore. We will try to rotate no more than three SC members each time to create continuity. Since both Mignon and Gilda have been Steering Committee members in the recent years, even though we have four new persons coming on board, it would not be of any issue. For people who are interested in attending SC meetings , please contact one of our SC members. We need to know the number for providing food. OWA provides a health care plan for its members. Please contact John & Ann Jakiemiec for details of the coverage. Please note: this benefit is available only to current, paid members of the OWA and it does not include a dental plan.